Through selective breeding we have succeeded in developing a fully auto-flowering version of this classic strain. Classic Northern Lights crossed with modern Ruderalis to create this Autoflowering Cannabis Strain that is very similar to the original NL. Height is reduced as with all auto genetics and the flowering time is much faster at around 9 weeks from seed to harvest. THC Levels are reasonable for an autoflowering marijuana strain and the ganja will give you an Indica dominant high. Indica Highs are generally heavy and good for pure relaxation if you are someone who can't switch off. They are better than Sativa's for anxiety and can give very good pain relief for many different types of pain. 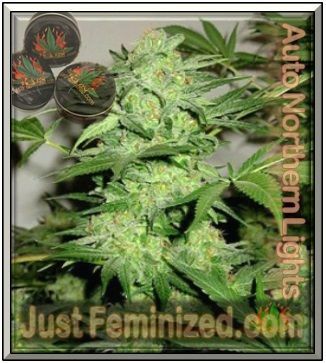 Northern Lights cannabis seeds have been used by commercial growers since the late 1980s. It has won various harvest awards along the years and has contributed to so many of the genetics that are available today. The plants have a high bud to leaf ratio, produce compact buds and have exceptional resin production. They well suited for indoor and outdoor growing and are known for being great yielders. The flavour of the smoke is fairly neutral and you can expect a full bodied Indica stone.